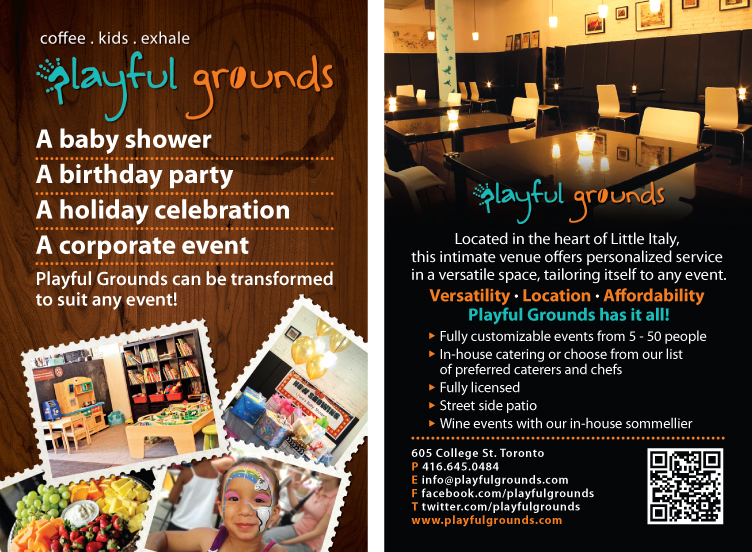 Welcome to the Playful Grounds Party Page! Have a look at the various party packages below and remember that we can build you a custom party package to suit your needs! * This package is available in addition to our basic package. *** If you only want to use the space but not purchase the any of the party packages or extras, the cost is $225.00 (plus HST and gratuity). This fee includes staff to set up and clean up afterwards and use of the cafe for 2 hours (includes additional quarter hour before and after for set up and clean up). A cash bar is staffed. If you go over two hours the fee is $75.00 for each additional hour. You are welcome to bring in your own food. *** If you only want to use the space but not purchase the any of the party packages or extras, you can have the room at no cost as long as there is a guaranteed $350.00 in bar sales.